When an app is popular, it often gets into Apple Featured Selections, which helps to attract more users. But what do you do when your app is not yet released? Is it possible to attract users without top ratings and with a small budget? We have the example of Babycare, an app for taking care of newborns, which proves that it is possible. Maxim Kolpakov, CEO of Wachanga, shared his experience. The product team has been using AppFollow since 2017. The Babycare iOS app was released on the 3rd of April. The next 9 weeks led the app to the Top 50 in the Medical category in the USA, Russia, Spain, Turkey and Korea, with an average rating of 4.8. 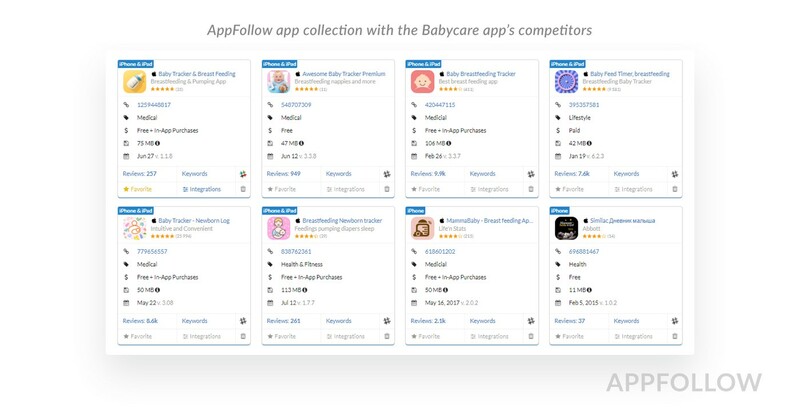 Wachanga constantly works with users’ feedback, and as a result the Babycare app has only 6% of negative reviews. Two weeks after the launch, the app started making profit. This article will be useful if you want to make your app’s launch in the App Store flawless. We tried to skip using paid options as much as we could in order to keep the guide suitable for everyone. Interested in promoting your app on Google Play? Check out the example of how to increase your installs there. 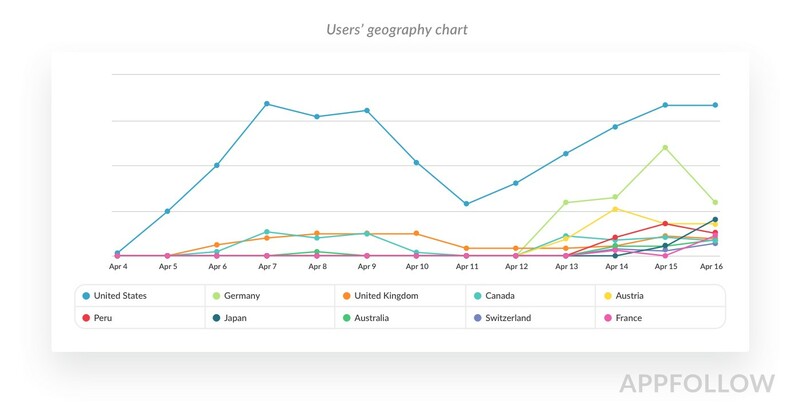 Keeping your users and analyzing app metrics. Before launching an app, spend a week making sure you’ve done everything to increase its discoverability to users. Choose a category. You can choose two categories on the App Store: a primary and a secondary one. The primary category is important for the app. App games can have two subcategories to define the target audience. Define leaders of the category and competitors. Check what keywords and call-to-action slogans they use, and how they response to users’ reviews. On AppFollow you can monitor two apps on a free subscription — that’s enough to draw your first conclusions. Based on the information you’ve got, prepare your basic ASO: title, subtitle, keywords, icon and screenshots. Planning to release your app in several countries? Then make sure you have the necessary translations (although this step can be done later). Wachanga created the iOS app Babycare & Breast Feeding. Primary category: Medical; Secondary: Lifestyle. The team gathered all its competitors in a separate collection using AppFollow. This can be done before publishing your own app. This way it’s easier to monitor changes in each app at the same time. 3. The team prepared basic promo materials in English: title, subtitle. keywords, icon, screenshots. 4. The apps were translated into 30 languages. Babycare & Breast Feeding launched in the USA initially. However, this may not work for every app. The US market is tough — more competitors and a high level of entrance will require a lot of energy and money. A good option, which the developers from Wachanga use, will be to focus on launching in other countries to see how you can modify your app’s features and ASO. Then once all possible issues are solved, go and win over the American users. When the App Store approves and publishes the app, it’s time to find users and convince them to install and use it. Ads. Choose what instruments to use. The most popular ones are Apple Search Ads, Google Ads, Facebook Ads, Twitter Audience Platform, Instagram feed ads, and AdMob. Bloggers and reviews. 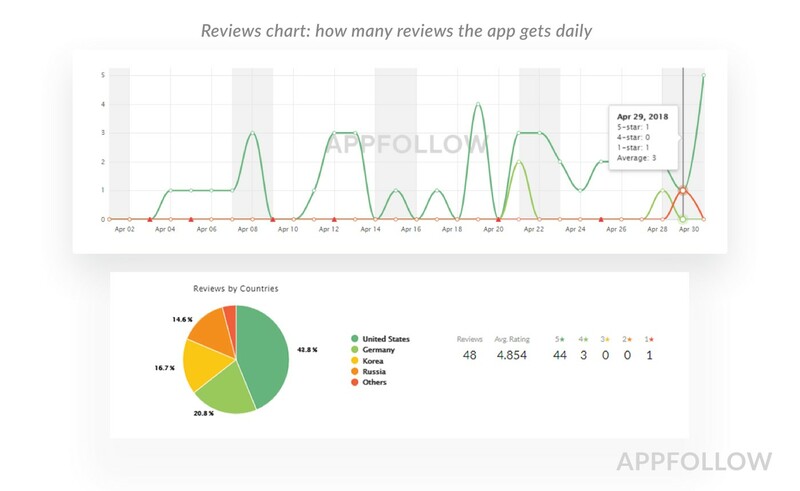 Make a list of sites publishing reviews of just-launched apps, such as, e.g., https://appadvice.com. There are more tools in our review. App updates. Apple has a separate field for informing of new releases in Apps and Games tabs, so don’t be afraid to release updates often — you’ll increase your chances for discoverability. Babycare & Breast Feeding bought some incent traffic but wasn’t focusing its strategy on it. Their primary way of promotion was using ads. Facebook Ads was selected as the most suitable for beginners. There are opportunities for making campaigns on a chosen location, enough mobile traffic, and a convenient profile. The company spent $200 and achieved 70 installs. However, they stopped using it as ads were not effective, and with each install the install rate fell in organic traffic. There are 200 applications for getting reviewed in the popular blogs. The results will be tracked later. Three releases in 2 weeks. 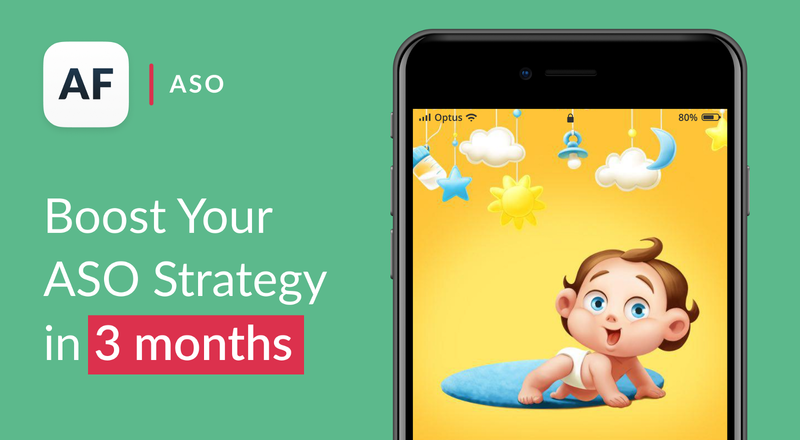 Regular updates helped Babycare to be promoted in Apple selections 16 times in four countries just in one month. It also helped to attract new users. Follow Apple guidelines to get your app approved within 24 hours. Tip: Consider getting your app featured as a way to increase app discoverability. It’s suitable for games and apps with high ratings. (Apple rarely features apps with 3*.) We describe other criteria that Apple applies. This approach may not work for apps with no ratings and reviews. If you don’t have enough ratings, try in-app rating requests. Read more about it in our article. 3. The first four purchases bring $18. We have already worked on the title, icon, screenshots, and app description. Now it’s time to work on the keywords and app presentation to attract a more targeted audience. Work on a list of the words and phrases you would use to look for your app. Find all the possible synonyms and misspellings. Check your words in Google Keyword Planner. Research your competitors’ app titles. They have probably worked on their ASO strategy and added the keywords in titles. Combine all keywords and check with Suggestions, an App Store tool that will give you the most relevant phrases for the words you test. Ask your friends and colleagues to search for apps on a particular topic and see what words and phrases they use. The list of words is your semantic core; that’s what you must rely on in your ASO strategy. 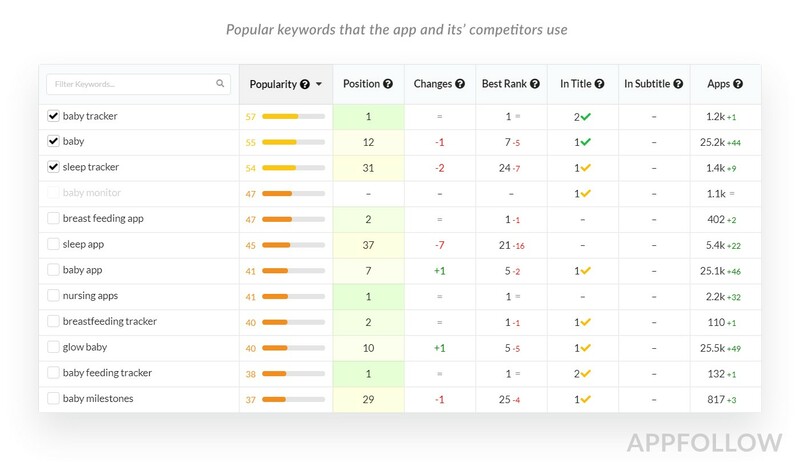 Add the main keywords in the app title — this will give you more search results. 1. 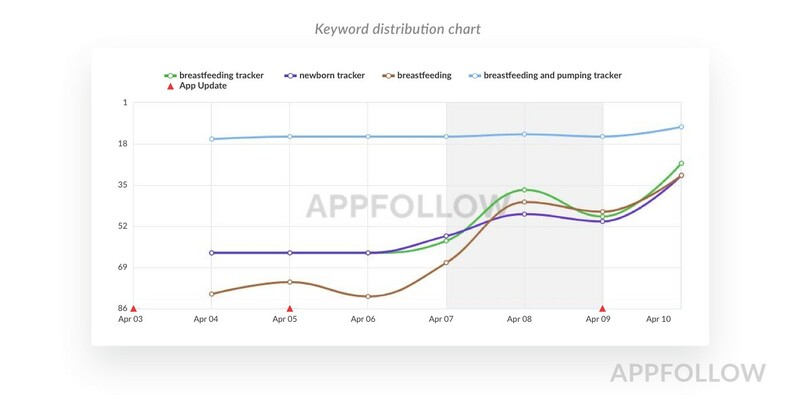 Before launch the main keywords were: breast, feeding, breastfeeding, tracker. 2. Added synonyms were: pumping, feeding, nursing, baby, newborn, and app. 3. 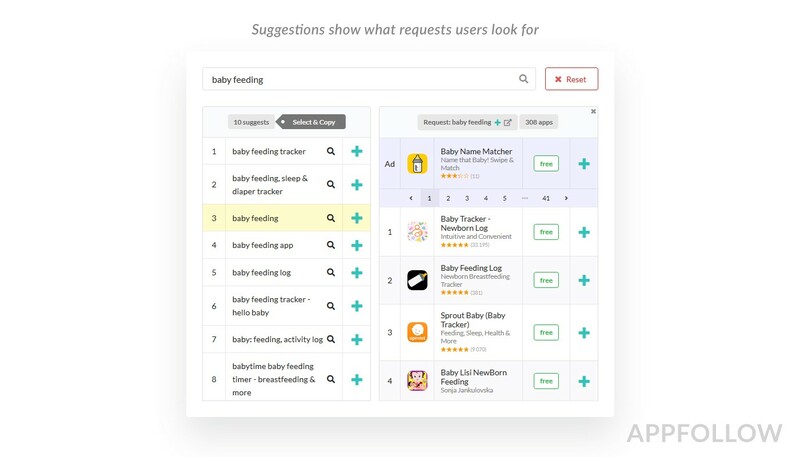 Based on the keyword “breastfeeding”, there were suggestions such as “feed baby”, “breastfeeding app”, “pumpspotting breastfeeding app”, “diary of a breastfeeding mom”. You can check the traffic score of each of the words and choose the most popular ones. 4. Competitors used words such as “baby”, “tracker” and “sleep”. 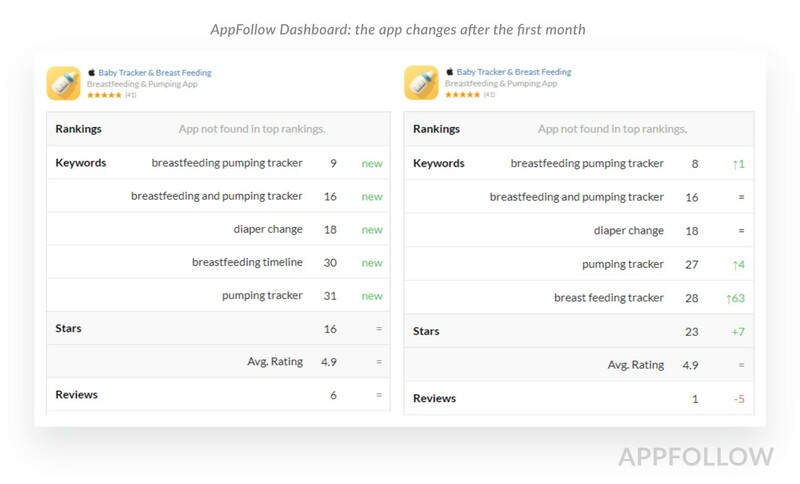 In our example the app has three keywords in the title — Babycare, Breast, and Feeding. 5. Each location will have the list in Suggestions. Here you can choose more relevant words. For example, the word “monitor” hasn’t been used. By adding it, it’s possible to track how the weekly conversion rate changes. — The semantic core for the App Store is not going to work on Google Play, and vice versa. Remember that these are two separate projects. — The stores suggest using app titles, but don’t rush to use them if users don’t know about you yet. This approach works only for popular apps such as, e.g., Tinder or Uber. — Don’t try to fill all the fields with keywords. If you use too many of them, less relevant words will decrease the conversion rate. — Don’t try to fill in all possible characters in the keyword field. Having launched in Russia, Wachanga used 50% of the relevant keywords. It appeared that fewer keywords brought a more relevant audience. If you use as many keywords as you can, the irrelevant ones will dilute your way to your ideal customer, and your conversion rate will fall. Within the first month search positions grew, and Babycare appeared in the Top 30 of important search requests. The app was released in 140 countries and translated into seven languages. There were 250 active users who would enter the app daily to use it. You don’t need to spy on your users with a camera to identify what they want. Talk to them instead. Customer Development methodology will help you to look at your product not as a set of features but as a solution for your users’ needs. When was the time of your last MOT? What were the difficulties with it? Is there another option you would use? What inconvenience does this cause you? Don’t try to sell your product. It might be that there is another solution that already exists. What do you think of the opportunity to use an app to make an appointment for MOT instead of a call? How would it help to save you time? What would you think of some additional features? Before launching Babycare & Breast Feeding, the company got in touch with the target audience — moms. This is the way the product team usually works before releasing a new product. By doing so they defined what their users cared about and what features they might be interested in. Such information was easier to get in the native language. Regarding other languages, Babycare developers looked for the active moms on social media, and conducted interviews with them. As a result there were 10 segments of users according to problems and requests. Based on the segments of users and their needs, several hypothetical “problem–solution” models were offered to the moms. The team set up several meetings and calls (a good option for customers worldwide), in which they asked moms to use the prototype and describe their experience of using it. They recorded the whole process to ensure they didn’t miss anything. For example, the team found that breasts in profile was the best option for an icon — it didn’t look “vulgar” or “confusing”, unlike some other options that were offered. Before the interview, define two or three hypotheses that you want to check. Record your interview and make notes after it, including results and the user’s segment. Don’t just ask questions, but communicate. Ask questions in such a way that they can give you full answers. Try to provoke the users — then they will tell you what they really think of your product and not what you expect them to say. Don’t be afraid to hear about the drawbacks — that’s significant information as well. Always ask, “Why?” Keep asking to get full and more detailed answers that would make a basis for your analysis. Phrases that your clients use to describe their needs and solutions could be used as marketing assets — screenshots, onboarding, etc. It’s like you speak the same language as your audience, and as a result you’ll get a higher conversion rate. Having conducted interviews made a huge difference in improving the app — it had the features that were really important for the users. E.g., many women breastfeed not by the clock but on demand. And every mom uses the timer differently: Some calculate the time from the start of feeding till the start of the next one, others from the end of feeding till the start of the next one. Some women need to have a strict daily schedule, while others want to make sure their babies have eaten enough. These are different user stories, and once the developers implanted feeding trackers, it improved reviews and ratings. Babycare & Breast Feeding was included in the Top 5 based on keyword search, and made Top 50 in its category. The first 1.5 months attracted 520 active users and received 48 reviews. 90% of positive reviews were received thanks to monitoring and working with customers’ feedback. In the next article we’ll share how to keep new users: what methods you can use, why you need A/B testing, and how they influence conversion rates. Can’t wait for the next one? Contact us and get a free ASO consultation.